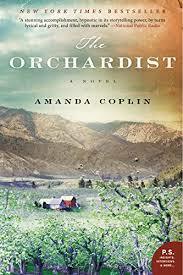 a book chick: "The Orchardist"
my take: The last 20 or so pages of this were some of the best writing I've ever read - poignant and moving and touching and poetic. Heartbreakingly wonderful. And the rest of the book was pretty good. It's the story of the orchardist, two runway girls, their off-spring, an old maid, fruit, and horses. It's quiet and pastoral and deep. I didn't put this in my top picks of first half of year because it's not a showy, obvious-you'll-love-it novel. A bit off the beaten path. I loved it (four and half to five stars), daughter thought it was good (three stars).